In the past, we've talked about the purpose and scope of biopics. Given the understanding that these movies are not documentaries, it's not out of the question to approach them with a desire for knowledge. This is especially true if the subject matter is something which has made the headlines. These films are placed in the unique position of having the opportunity to take the audience deeper into the true story and give us something which we didn't know, or even better, something which we weren't expecting. This is certainly the case with Snowden, a film which truly embraces the notion of a biopic. The story in Snowden begins with Edward Snowden (Joseph Gordon-Levitt) in training with the Special Forces. After an injury forces him to leave, Snowden is accepted by the CIA and is taken under the wing of Corbin O'Brian (Rhys Ifans), who is immediately impressed with Snowden's work with computer security networks. At this same time, Snowden begins dating Lindsay Mills (Shailene Woodley), a young woman whose political ideals do not align with his. When Snowden is transferred to Switzerland, Lindsay goes with him. It's here that Snowden begins to truly delve into spy work and gets his first taste of how unethical the Agency can be. He then moves into private contracting and transfers to Tokyo, an assignment which exposes more of how the U.S. intelligence community uses technology. After moving back to the States, Snowden takes a position in Hawaii. It is here that he truly understands how much the government is infringing on people's rights, and decides to do something about it. When Edward Snowden decided to expose the reach of the U.S. intelligence community in 2013, the story made international headlines. While Snowden was dealing with living in exile, the media debated about whether or not he'd done the right thing, while many were very disturbed by what had been uncovered. Interviews with Snowden appeared on television, as the government scrambled to get their story straight and make changes to their rules. And yet, while all of this was going on, I don't recall hearing a great deal about who Edward Snowden truly was. I will admit that I didn't read every news report about Snowden, but I'd seen him portrayed as a simple technician who had decided to become a whistleblower. Therefore, right out of the gate, I was surprised by the information provided by this film. I had no idea that Snowden had been in the military, so we immediately see him as more than just a computer geek. However, the movie does not shy away from showing off Snowden's computer skills, as we then see him moving up the ranks in the CIA due to his abilities. In fact, we see that Snowden becomes highly recruited not only due to his talent, but for his ideas as well. Through his relationship with O'Brian, we see how he rubs elbows with high-ranking intelligence officials who value his expertise. At this same time, we see how Snowden slowly becomes disillusioned with his job and the secrets which he learns. In addition, having to maintain those secrets puts a real strain on his relationship with Lindsay. Seeing Oliver Stone's name on the credits, I'm sure that many will assume that Snowden is a very biased movie. However, I felt that Stone did a good job of keeping things very even-keeled (assuming, of course, that what we are seeing accurately reflects the reality of Snowden's story). At the outset, we see that Snowden is very much a right-wing patriot who truly believes in his government. As he gets more and more clearance and begins to delve deeper into espionage, his views start to change. Stone does not beat us over the head with this -- In fact, things are a bit too subtle at times. Parts of the story are very detailed, but for a movie which runs over 2 hours, some things are glossed over, such as how and why Snowden became a computer whiz. Also, as with most biopics, there are moments here where we can't help but ask, "Is that true?". I will see that Stone has made an artistic choice during the finale which is very powerful and nicely caps off the movie. Snowden is a bit too surface at times, and could have certainly been more emotional, but there's no denying that it provides us with a great deal of information and it brought me much closer to the real story. 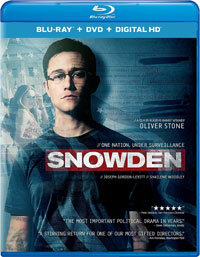 Snowden will make you distrust your webcam on Blu-ray Disc courtesy of Universal Studios Home Entertainment. The film has been letterboxed at 2.35:1 and the Disc contains an AVC 1080p HD transfer which runs at an average of 30 Mbps. The image is very sharp and clear, showing no overt grain and no defects from the source materials. The colors look good and the image is never overly dark or bright. Stone has shot the film in a very natural style and the colors and tones look very realistic. The image shows a nice amount of detail and is rarely soft, and the depth is fine. The Disc carries a DTS-HD Master Audio 5.1 track which runs at 48 kHz and an average of 4.0 Mbps. The track provides clear dialogue and sound effects. The stereo and surround effects work very well here, most notably during the military training sequence and with some of the transitions. In addiction, the scene in which Edward and Lindsay walk through D.C. offers some nice examples of sounds coming from off-screen. The Snowden Blu-ray Disc contains only a few extras. "Finding the Truth" (4 minutes) is a brief featurette which features comments from Gordon-Levitt and Stone who discuss the story and themes of the film. This piece actually consists mostly of clips from the movie. "Snowden: Q&A" (41 minutes) is a panel featuring Gordon-Levitt, Woodley, Stone and via video, Edward Snowden, moderated by Matt Zoller Seitz of RogerEbert.com, in which the film is discussed. The Disc contains five DELETED SCENES which run about 9 minutes. Most of these are brief and while they don't introduce any new characters or subplots, one does clear up a brief scene from the second half of the film.